King Mo went down the pedestal and admitted he is the underdog. 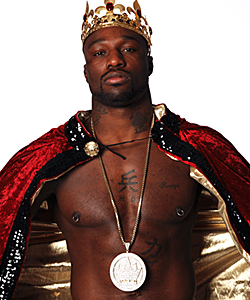 Muhammed Lawal will get inside Strikeforce cage on August 21. He is going to be on promotion for the light-heavyweight champion, strongly suggesting a title defense. But those who think that King Mo and Rafael “Feijao” Cavalcante were at same level, he immediately disagreed. Lawal who had improved 7-0 upon gaining the title with his April win over Mousasi has been considered by so many as one of the sports top talents since 2008. But despite all the glory, humility of this man still finds him red handed. A former All-American and international wrestling star, he has became known for his knowledge on combat styles that he often shows in fights. Meanwhile, Cavalcante who score 9-2 is up with 4 more fights than Lawal, though he’s on the scene since 2006. Before the Mousasi fight, he hinted about “Cuban-Boxing” style, though the 5 rounds of their fight evolved around grappling techniques. For this fight he is now saying that he’ll use a Bernard Hopkin style. Cavalcante noted that he wanted his ground skills for play. For the knowledge of those who do not know, he is a black belter for jiu-jitsu. King Mo will find his way to win.